BK polyomavirus (BKV) is a common infection after kidney transplantation. It infects up to 90% of the general population in their childhood. The virus remains latent in immunocompetent individual and rarely causes disease. However, the virus can reactivate in immunocompromised patients causing clinical disease. BK viruria develops in 30% of kidney transplant recipients, with viremia and nephropathy (BKVN) in 11% –13% and 8%, respectively.,, BK viremia peaks in first 3 months  while BKVN typically occurs 9–12 months after transplantation. However, some cases of BKVN have been reported as early as 1 week posttransplantation., Around 50% of kidney transplant recipients lose their graft after developing BKVN. There are various strategies to treat BKVN. Reduction in immunosuppression is widely regarded as the cornerstone treatment for BKVN. This strategy focuses on routine patient monitoring for development of BK viremia and with reduction of immunosuppression on diagnosis.,, However, there is no widely accepted standardization for this strategy., Naturally, there is an inherent risk of rejection with immunosuppression reduction and any strategies employed must take into account the delicate and precarious balance of infection and rejection. Various anti-BKV agents are used for treatment of BKVN. These include intravenous immune globulin (IVIG), cidofovir, leflunomide, and the fluoroquinolone antibiotics.,, Each therapy has its limitations and usage must be tailored to individual patients. IVIG is expensive, nephrotoxic and requires hospital admission for intravenous administration. IVIG through osmotic injury causes vacuolation in proximal tubular epithelial cells leading to acute kidney injury  Cidofovir is nephrotoxic and reportedly has less potent anti-BKV activity than the other therapies., Leflunomide has a relatively long half-life (15 days), wide interpatient variability, and significant hematological and hepatic toxicity. On the other hand, fluoroquinolones are cheap, widely available, and have lower incidence of side effects. As compared with IVIG, cidofovir, and leflunomide, fluoroquinolones are cheap and less toxic. However, long-term use for 1–3 months as a prophylaxis may not be without sequelae. Gastrointestinal and central nervous system (CNS) effects are the most frequent adverse events, occurring in 2–20% of patients treated with fluoroquinolones. Gastrointestinal side effects include nausea, vomiting, diarrhea, and abdominal pain. CNS side effects include headache, dizziness, drowsiness, confusion, insomnia, fatigue, malaise, depression, somnolence, seizures, vertigo, lightheadedness, restlessness, tremor. Rarely, it causes QTc prolongation, hepatotoxicity, abnormal or bitter taste, and tendon rupture.,,, In kidney transplant recipients, QT prolongation, hypoglycemia, diarrhea, and rash were not significantly higher with use of levofloxacin. However, a nonsignificant increased risk of tendinitis (6/76 [7.9%] vs. 1/78 [1.3%] was reported by Knoll. Drug resistance is an emerging problem. Bacterial resistance to fluoroquinolones occurs either with the induction of amino acid changes in specific areas of the parC and parE genes of topoisomerase IV or in the gyrA gene of topoisomerase II. Increased efflux is another mechanism of drug resistance.,,,, Little is known about BKV resistance. However, long duration of prophylaxis for a period of 1–3 months may provoke resistance in BKV. Selectivity index is defined as the ratio of the 50% reduction in host cell replication value to the 50% virus inhibitory concentration value. The safety and effectiveness of antimicrobial agents are measured by their minimal inhibitory concentration of the organism as well as the host. Effective and safe antimicrobial should have a selectivity index of >10. Unfortunately, till this date, no effective anti-BKV therapy is available. Farasati et al. used quantitative polymerase chain reaction (PCR) assay enabling them to get viral culture sensitivity results within 7 days. They tested leflunomide and cidofovir against BKV and found selectivity index 2.3 ± 0.8 and 3.8 ± 0.8 for cidofovir and leflunomide, respectively. Randhawa et al. used the same assay to determine 50% virus inhibitory concentrations and 50% reduction in host cell for ciprofloxacin, levofloxacin, gatifloxacin, norfloxacin, moxifloxacin, ofloxacin, novobiocin, and coumermycin. The selectivity index ranged from 0.6 ± 0.2 to 3.6 ± 0.8 for all these agents. Unfortunately, none of these agents have selectivity index >10 to be considered effective. From this, we can assume that various anti-BKV agents though have some activities but due to low selectivity index, they may not be efficacious in eradication of the virus. In vitro studies on efficacy of fluoroquinolones for treatment of BKV began in the 1980s. Encouraging in vitro results led to subsequent in vivo studies in clinical settings involving real patients. Portolani et al. used nalidixic acid and oxolinic acid against BKV in vero cell cultures in 1988. They exposed the virus to 0.02–0.04 mM of nalidixic acid and 0.2 mM of oxolinic acid. The inhibition of virus replication was detectable at day 4 postinfection in cultures. The inhibition of development of cytopathology and of virus-induced cell death was demonstrable in cultures treated for 12 days with the drugs. Through their experiment, they showed that fluoroquinolones act through a mechanism involving DNA topoisomerase. In the same year, another group published similar results using norfloxacin, coumermycin A1, and nalidixic acid. They studied these agents against BKV in BSC-1 and vero cell culture and showed that all three agents suppress BKV replications. Ali et al. used levofloxacin, trovafloxacin, ciprofloxacin, and ofloxacin using DNA tumor virus as their model. All four quinolones tested were effective in the inhibition of SV40 plaque formation and DNA replication. In addition, they found that each of these quinolones was inhibitory to the helicase activity of SV40 large tumor antigen. Sharma et al. assessed the effect of ofloxacin and levofloxacin on BKV replication in proximal tubular epithelial cell. Ofloxacin and levofloxacin inhibited BKV load in a dose-dependent manner yielding a 90% inhibition at 150 μg/ml. They concluded that ofloxacin and levofloxacin inhibit but do not eradicate BKV replication in proximal tubular epithelial cells. The presence of BKV in salivary gland in patients with HIV infection led Jeffers-Francis et al. to check the effectiveness of ciprofloxacin, cidofovir, and leflunomide in salivary gland and vero cells. 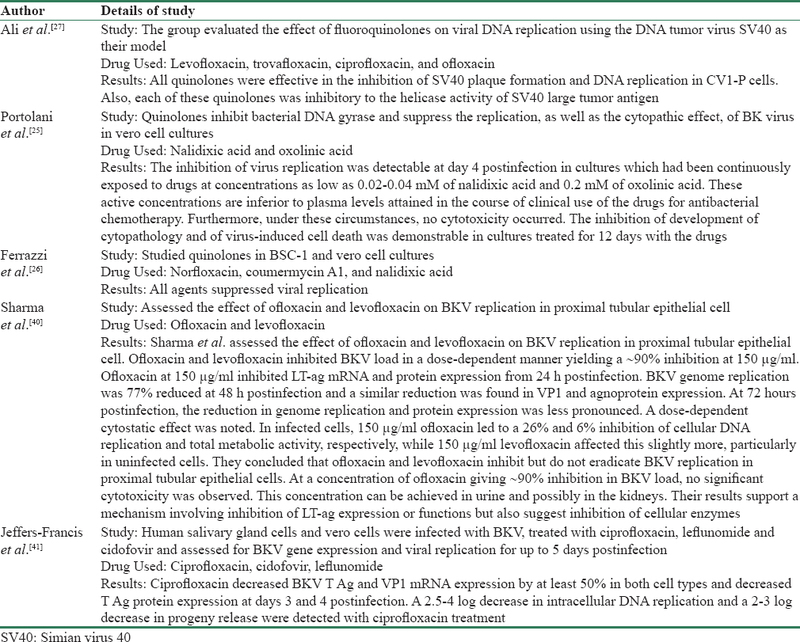 Human salivary gland cells and vero cells were infected with BKV and treated with antiviral drugs and assessed for BKV gene expression and viral replication for up to 5 days postinfection. The kinetics of BKV replication was different in salivary gland cells compared to kidney cells. Treatment of human salivary gland cells with each of the three drugs produced modest decreases in BKV genome replication. Thus concluded that the in vitro activity of cidofovir and leflunomide is modest, and the selectivity index is low and there is a need to develop more effective and less toxic anti-BK virus drugs for clinical use. Ciprofloxacin was first reported to decrease BKV viruria in a study involving hematopoietic stem cell transplant recipients. In this study, effective urinary concentration of ciprofloxacin was comparable to in vitro studies suggesting a useful prophylactic role for ciprofloxacin in the targeted patients. [Table 1] summarizes various in vitro studies done on fluoroquinolones against BKV. Fluoroquinolones have been used in both hematopoietic stem cell and kidney transplant recipients for prevention of BKV infection. Its effectiveness was first reported in a prospective observational study in hematopoietic stem cell transplant in 2005. Ciprofloxacin oral (500 mg twice a day) or intravenous (200 twice a day) was compared with cephalosporin for 50 days. The study showed that ciprofloxacin is more effective than cephalosporin in decreasing BKV reactivation after hematopoietic stem cell transplantation. Another study showed similar results with 60 days course of ciprofloxacin (500 mg twice a day) after hematopoietic stem cell transplantation in preventing severe BKV hemorrhagic cystitis. In a report of three cases, a daily dose of levofloxacin 500 mg for 2 months has also been used successfully to treat established hemorrhagic cystitis in hematopoietic stem cell transplant in three cases. Similarly, Umbro et al. reported a case of successful treatment of BKV infection with 10 days course of ciprofloxacin in a kidney transplant recipient who also had rejection. They analyzed BKV noncoding control region sequences in all the positive samples. These positive samples showed the presence of archetypal sequences with two single nucleotide substitutions and one nucleotide deletion that interestingly were all representative of the subtype/subgroup I/b-1 as identified by the viral protein 1 sequencing analysis. The changes in genome were accompanied by reduction in BKV both in urine and blood. This was interesting because they successfully eradicated BKV while the patient was taking maximum doses of immunosuppressive medications due to concurrent rejection. Cekmen et al. in another case report reported that 6 months therapy with fluoroquinolones treatment reduced the viral load and improved the clinical findings. Fluoroquinolones have been reported to be effective in three retrospective analyses in kidney transplant recipients. Gabardi et al. showed that a 1 month course of levofloxacin or ciprofloxacin significantly reduced BKV viremia at 1 year. In another retrospective analysis, 9 kidney transplant recipients diagnosed with BK viruria ≥106 copies/mL and viremia ≥500 copies/mL who failed to respond to reduction in immunosuppression were treated with ciprofloxacin 250 mg twice a day for 1 month. Three patients showed complete viral clearance and another 3 had a ≥50% decrease in plasma viral load. However, Wojciechowski et al. reported that 1 month prophylaxis may not be adequate in preventing BKV on long term. Wojciechowski et al. in their retrospective analyses showed that prophylactic use of ciprofloxacin reduces BK virus infection at 3 months but not at 1 year. Unfortunately, most of the literature from both kidney and hematopoietic stem cell transplants were from retrospective studies or case reports. To date, there has been no randomized control study to suggest that fluoroquinolones are effective against BKV infection. [Table 2] summarizes the studies in favor of effectiveness against BKV. Not all evidence for fluoroquinolones are favorable. Our literature search showed 8 studies that concluded that fluoroquinolones are not effective. The retrospective analysis by Wojciechowski et al. found ciprofloxacin prophylaxis to be effective at 3 month but not at 1 year. In a prospective observational study in hematopoietic stem cell transplant, Phipps et al. used ciprofloxacin 500 twice a day from day of the conditioning to day 56. They used the intravenous preparation if patients were unable to tolerate orally and also used levofloxacin in asymptomatic patients with rising BKV titers despite ciprofloxacin. Their analysis showed that ciprofloxacin (or levofloxacin) failed to reduce rates of grades 2–4 hemorrhagic cystitis. In another prospective study, Patel et al. used a ciprofloxacin 500 mg twice a day for 3 months. There was 27% reduction in BKV infection. However, it was not statistically significant (P = 0.39) as compared to control group who did not receive ciprofloxacin. Trend of negative results was confirmed in another prospective observational study by Koukoulaki et al. They failed to show benefit of ciprofloxacin on BKV reactivation or monthly incidence. Lee et al. conducted a multicenter double-blinded randomized controlled trial in 2014 to evaluate the efficacy of levofloxacin in the treatment of BK viremia. The group used levofloxacin 500 mg once a day for 30 days. Levofloxacin was chosen ahead of ciprofloxacin because of its greater bioavailability., The study enrolled 46 patients with a diagnosis of BK viremia but only 39 patients were randomly assigned to get either levofloxacin or placebo. A 30-day course of levofloxacin did not significantly reduce BK viral load or improve allograft function at 3 months. This landmark study is important because it was the first study to minimize the confounding factors often seen with observational studies. Unlike other studies, they monitored BKV viremia instead of BKV viruria for initiation of the therapy. However, there were some limitations to this study. There was no uniformization of induction and maintenance protocols used by different centers, and despite randomization, some centers appear to use leflunomide in both arms. The study also did not assess the resistance of BKV strains, which could affect the unfavorable outcome. Another double-blinded randomized control trial was published in 2014 to assess the role of fluoroquinolones in BKV prevention. The primary outcome was time to occurrence of BK viruria (detected using quantitative real-time PCR) within the 1st year of transplantation. Secondary outcomes included BK viremia, peak viral load, rejection, and patient and allograft survival. The trial used levofloxacin 500 mg once a day for 3 months. Moreover, unlike previous trials, all virologic testing was performed centrally at a reference laboratory with a validated assay that was used for clinical purposes. A 3-month course of levofloxacin initiated early following transplantation did not prevent BK viruria. In addition, there was no significant difference between the two groups in regard to any of the secondary end points. There were few limitations in this randomized control trial. Due to resource restrictions, the trial follow-up was terminated prematurely for a subset of 27 patients who had not developed viruria. Second, another potential limitation was the choice of primary outcome (BKV viruria rather than BKV viremia). Viremia rather than viruria will be a good clinical outcome to assess because most monitoring protocols for adjustment of immunosuppression are based on viremia. A recent observational prospective study published in 2016 which used ciprofloxacin as prophylaxis was also found to be negative. We found one meta-analysis by Song et al. on fluoroquinolone prophylaxis. The primary outcome of this meta-analysis was BK viremia and viruria at 1 year post-transplantation. Secondary outcomes were BK virus-associated nephropathy (BKVN), graft failure, and fluoroquinolone-resistant infection. They included 8 comparative studies including randomized control trial and observational studies. A total of 1477 participants with a mean duration of fluoroquinolone prophylaxis of >1 month were analyzed. They concluded that at 1 year, fluoroquinolone prophylaxis was not associated with a decreased incidence of BK viremia. Despite the limitations observed in these two randomized control studies,, findings cannot be ignored. Even though there were slight methodological flaws, the double-blinded and randomized nature of the trials arguably provided better evidence than current data that were derived from prospective or retrospective observational studies. Moreover, a recent negative meta-analysis further argues against use of fluoroquinolones against BKV. A new double-blind randomized control trial using ciprofloxacin 250 mg once daily for 3 months has been running since January 2013. The trial primary outcome is BK viremia or the presence of BK viral inclusions on kidney biopsy specimens. The results of the trial are still awaited. It will be interesting to see its result. [Table 3] summarizes the studies that reported against the effectiveness of fluoroquinolones in BKV viruria or viremia. In our opinion, we believe that fluoroquinolones have anti-BKV activity. The evidence has been demonstrated in various in vitro studies. However, its low selectivity index (<3.9) has raised some doubts on its effectiveness against BK virus in the clinical settings.In vivo studies which favor fluoroquinolones are mostly retrospective or case reports, but recent prospective evidence by Leung et al. has given rise to optimism for a role in prevention of BKVN. However, the recent negative reports in the double-blinded randomized control trial and a negative meta-analysis have added uncertainties in its usefulness in prevention of BKVN. This is further compounded by the relative high cost in using these agents long term and the possibility of complications such as Achilles tendonitis and microbial resistance., We believe the current evidence is not favorable enough to warrant the use of fluoroquinolones for long-term prophylaxis. Intermittent screening for BKV viremia and preemptive reduction in immunosuppression on detection remains the best strategy., More research is needed to validate current available evidence and investigate the potential of other agents. Fluoroquinolones have been used in vitro and in vivo studies for prevention of BKVN. At the moment, it cannot be recommended either as prophylactic or therapeutic option. The only viable option is screening for BKV viremia and preemptive reduction in immunosuppression on detection of the virus. There is a need for an effective and less nephrotoxic drug to prevent or treat BKVN. There was no financial support and sponsorship for this review article. Hirsch HH, Steiger J. Polyomavirus BK. Lancet Infect Dis 2003;3:611-23. Hirsch HH, Knowles W, Dickenmann M, Passweg J, Klimkait T, Mihatsch MJ, et al. 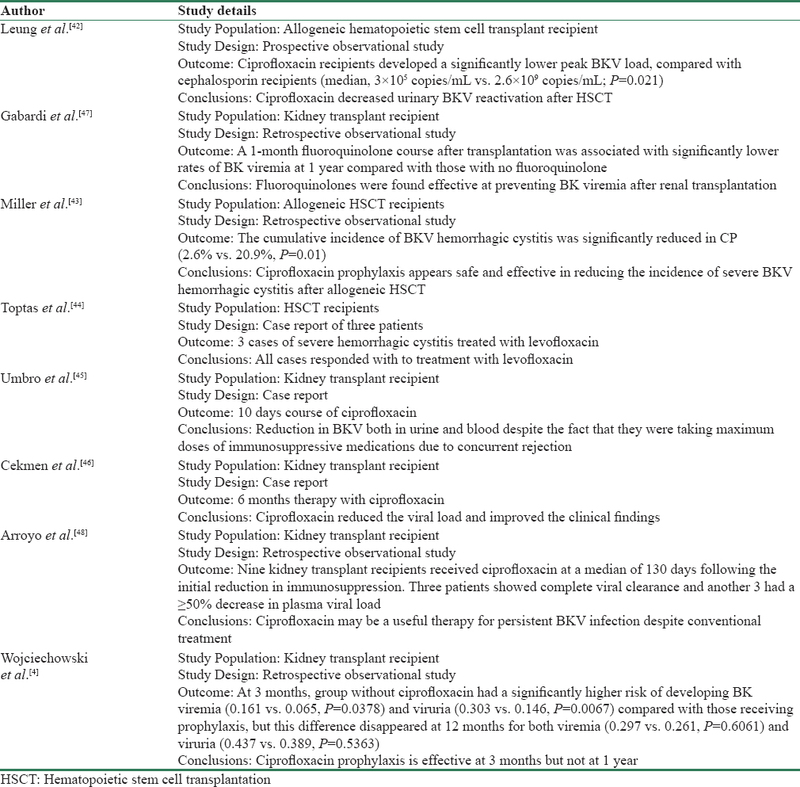 Prospective study of polyomavirus type BK replication and nephropathy in renal-transplant recipients. N Engl J Med 2002;347:488-96. Brennan DC, Agha I, Bohl DL, Schnitzler MA, Hardinger KL, Lockwood M, et al. Incidence of BK with tacrolimus versus cyclosporine and impact of preemptive immunosuppression reduction. Am J Transplant 2005;5:582-94. Wojciechowski D, Chanda R, Chandran S, Lee B, Webber A, Macaraig M, et al. Ciprofloxacin prophylaxis in kidney transplant recipients reduces BK virus infection at 3 months but not at 1 year. Transplantation 2012;94:1117-23. Koukoulaki M, Grispou E, Pistolas D, Balaska K, Apostolou T, Anagnostopoulou M, et al. Prospective monitoring of BK virus replication in renal transplant recipients. Transpl Infect Dis 2009;11:1-0. Dall A, Hariharan S. BK virus nephritis after renal transplantation. Clin J Am Soc Nephrol 2008;3 Suppl 2:S68-75. Trofe J, Hirsch HH, Ramos E. Polyomavirus-associated nephropathy: Update of clinical management in kidney transplant patients. Transpl Infect Dis 2006;8:76-85. Bonvoisin C, Weekers L, Xhignesse P, Grosch S, Milicevic M, Krzesinski JM, et al. Polyomavirus in renal transplantation: A hot problem. Transplantation 2008;85:S42-8. Ramos E, Drachenberg CB, Wali R, Hirsch HH. The decade of polyomavirus BK-associated nephropathy: State of affairs. Transplantation 2009;87:621-30. Wiseman AC. Polyomavirus nephropathy: A current perspective and clinical considerations. Am J Kidney Dis 2009;54:131-42. Saad ER, Bresnahan BA, Cohen EP, Lu N, Orentas RJ, Vasudev B, et al. Successful treatment of BK viremia using reduction in immunosuppression without antiviral therapy. Transplantation 2008;85:850-4. Roskopf J, Trofe J, Stratta RJ, Ahsan N. Pharmacotherapeutic options for the management of human polyomaviruses. Adv Exp Med Biol 2006;577:228-54. Rinaldo CH, Hirsch HH. Antivirals for the treatment of polyomavirus BK replication. Expert Rev Anti Infect Ther 2007;5:105-15. Levy JB, Pusey CD. Nephrotoxicity of intravenous immunoglobulin. QJM 2000;93:751-5. Wu SW, Chang HR, Lian JD. The effect of low-dose cidofovir on the long-term outcome of polyomavirus-associated nephropathy in renal transplant recipients. Nephrol Dial Transplant 2009;24:1034-8. Lamoth F, Pascual M, Erard V, Venetz JP, Nseir G, Meylan P, et al. Low-dose cidofovir for the treatment of polyomavirus-associated nephropathy: Two case reports and review of the literature. Antivir Ther 2008;13:1001-9. Levine C, Hiasa H, Marians KJ. DNA gyrase and topoisomerase IV: Biochemical activities, physiological roles during chromosome replication, and drug sensitivities. Biochim Biophys Acta 1998;1400:29-43. Champoux JJ. DNA topoisomerases: Structure, function, and mechanism. Annu Rev Biochem 2001;70:369-413. Forterre P, Gribaldo S, Gadelle D, Serre MC. Origin and evolution of DNA topoisomerases. Biochimie 2007;89:427-46. Forterre P, Gadelle D. Phylogenomics of DNA topoisomerases: Their origin and putative roles in the emergence of modern organisms. Nucleic Acids Res 2009;37:679-92. Pommier Y, Leo E, Zhang H, Marchand C. DNA topoisomerases and their poisoning by anticancer and antibacterial drugs. Chem Biol 2010;17:421-33. Hooper D. Quinolones. In: Mandell GL, Bennett JE, Dolin R. Mandell, Douglas, and Bennett's Principles and Practice of Infectious Diseases. 5th ed. Philadelphia: Churchill Livingstone; 2000. p. 404-23. Hooper DC, Wolfson JS. Mechanisms of quinolone action and bacterial killing. In: Quinolone Antimicrobial Agents. 2nd ed. Washington, D.C.: American Society for Microbiology; 1993. p. 53-7. Wu JK, Harris MT. Use of leflunomide in the treatment of polyomavirus BK-associated nephropathy. Ann Pharmacother 2008;42:1679-85. Portolani M, Pietrosemoli P, Cermelli C, Mannini-Palenzona A, Grossi MP, Paolini L, et al. Suppression of BK virus replication and cytopathic effect by inhibitors of prokaryotic DNA gyrase. Antiviral Res 1988;9:205-18. Ferrazzi E, Peracchi M, Biasolo MA, Faggionato O, Stefanelli S, Palù G, et al. Antiviral activity of gyrase inhibitors norfloxacin, coumermycin A1 and nalidixic acid. Biochem Pharmacol 1988;37:1885-6. Ali SH, Chandraker A, DeCaprio JA. Inhibition of simian virus 40 large T antigen helicase activity by fluoroquinolones. Antivir Ther 2007;12:1-6. Walker RC. The fluoroquinolones. Mayo Clin Proc 1999;74:1030-7. Lipsky BA, Baker CA. Fluoroquinolone toxicity profiles: A review focusing on newer agents. Clin Infect Dis 1999;28:352-64. Stahlmann R, Lode H. Toxicity of quinolones. Drugs 1999;58 Suppl 2:37-42. Harrell RM. Fluoroquinolone-induced tendinopathy: What do we know? South Med J 1999;92:622-5. Knoll GA, Humar A, Fergusson D, Johnston O, House AA, Kim SJ, et al. Levofloxacin for BK virus prophylaxis following kidney transplantation: A randomized clinical trial. JAMA 2014;312:2106-14. Taba H, Kusano N. Sparfloxacin resistance in clinical isolates of streptococcus pneumoniae: Involvement of multiple mutations in gyrA and parC genes. Antimicrob Agents Chemother 1998;42:2193-6. González I, Georgiou M, Alcaide F, Balas D, Liñares J, de la Campa AG, et al. Fluoroquinolone resistance mutations in the parC, parE, and gyrA genes of clinical isolates of viridans group streptococci. Antimicrob Agents Chemother 1998;42:2792-8. Pan XS, Fisher LM. DNA gyrase and topoisomerase IV are dual targets of clinafloxacin action in Streptococcus pneumoniae. Antimicrob Agents Chemother 1998;42:2810-6. Piddock LJ, Johnson M, Ricci V, Hill SL. Activities of new fluoroquinolones against fluoroquinolone-resistant pathogens of the lower respiratory tract. Antimicrob Agents Chemother 1998;42:2956-60. Jones ME, Sahm DF, Martin N, Scheuring S, Heisig P, Thornsberry C, et al. Prevalence of gyrA, gyrB, parC, and parE mutations in clinical isolates of Streptococcus pneumoniae with decreased susceptibilities to different fluoroquinolones and originating from worldwide surveillance studies during the 1997-1998 respiratory season. Antimicrob Agents Chemother 2000;44:462-6. Farasati NA, Shapiro R, Vats A, Randhawa P. Effect of leflunomide and cidofovir on replication of BK virus in an in vitro culture system. Transplantation 2005;79:116-8. Randhawa PS. Anti-BK virus activity of ciprofloxacin and related antibiotics. Clin Infect Dis 2005;41:1366-7. Sharma BN, Li R, Bernhoff E, Gutteberg TJ, Rinaldo CH. Fluoroquinolones inhibit human polyomavirus BK (BKV) replication in primary human kidney cells. Antiviral Res 2011;92:115-23. Jeffers-Francis LK, Burger-Calderon R, Webster-Cyriaque J. Effect of Leflunomide, Cidofovir and Ciprofloxacin on replication of BKPyV in a salivary gland in vitro culture system. Antiviral Res 2015;118:46-55. Leung AY, Chan MT, Yuen KY, Cheng VC, Chan KH, Wong CL, et al. Ciprofloxacin decreased polyoma BK virus load in patients who underwent allogeneic hematopoietic stem cell transplantation. Clin Infect Dis 2005;40:528-37. Miller AN, Glode A, Hogan KR, Schaub C, Kramer C, Stuart RK, et al. Efficacy and safety of ciprofloxacin for prophylaxis of polyomavirus BK virus-associated hemorrhagic cystitis in allogeneic hematopoietic stem cell transplantation recipients. Biol Blood Marrow Transplant. 2011 Aug; 17(8):1176-81. Toptas T, Kaygusuz-Atagunduz I, Kani HT, Adiguzel C, Firatli-Tuglular T. Levofloxacin for the treatment of severe refractory BK virus-associated hemorrhagic cystitis in hematopoietic stem cell transplantation recipients: A report of three cases. Oncol Lett 2014;8:1775-7. Umbro I, Anzivino E, Tinti F, Zavatto A, Bellizzi A, Rodio DM, et al. Possible antiviral effect of ciprofloxacin treatment on polyomavirus BK replication and analysis of non-coding control region sequences. Virol J 2013;10:274. Cekmen MB, Bakirdoven S, Sayan M, Yilmaz A. BK virus nephropathy developing after renal transplantation and its treatment with ciprofloxacin: A case report. Transplant Proc 2012;44:3044-7. Gabardi S, Waikar SS, Martin S, Roberts K, Chen J, Borgi L, et al. Evaluation of fluoroquinolones for the prevention of BK viremia after renal transplantation. Clin J Am Soc Nephrol 2010;5:1298-304. Arroyo D, Chandran S, Vagefi PA, Wojciechowski D. Adjuvant ciprofloxacin for persistent BK polyomavirus infection in kidney transplant recipients. J Transplant 2014;2014:107459. Phipps C, Ng HY, Appan P, Loh Y, Koh M, Ho AY, et al. BK-virus prophylaxis: Still no answer. Bone Marrow Transplant 2013;48:1362-3. Koukoulaki M, Apostolou T, Hadjiconstantinou V, Drakopoulos S. Impact of prophylactic administration of ciprofloxacin on BK polyoma virus replication. Transpl Infect Dis 2008;10:449-51. Lee BT, Gabardi S, Grafals M, Hofmann RM, Akalin E, Aljanabi A, et al. Efficacy of levofloxacin in the treatment of BK viremia: A multicenter, double-blinded, randomized, placebo-controlled trial. Clin J Am Soc Nephrol 2014;9:583-9. Garrison MW. Comparative antimicrobial activity of levofloxacin and ciprofloxacin against Streptococcus pneumoniae. J Antimicrob Chemother 2003;52:503-6. Lubasch A, Keller I, Borner K, Koeppe P, Lode H. Comparative pharmacokinetics of ciprofloxacin, gatifloxacin, grepafloxacin, levofloxacin, trovafloxacin, and moxifloxacin after single oral administration in healthy volunteers. Antimicrob Agents Chemother 2000;44:2600-3. Lebreton M, Esposito L, Mengelle C, Del Bello A, Delarche A, Dörr G, et al. A 3-month course of ciprofloxacin does not prevent BK virus replication in heavily immunosuppressed kidney-transplant patients. J Clin Virol 2016;79:61-7. Song TR, Rao ZS, Qiu Y, Liu JP, Huang ZL, Wang XD, et al. Fluoroquinolone prophylaxis in preventing BK polyomavirus infection after renal transplant: A systematic review and meta-analysis. Kaohsiung J Med Sci 2016;32:152-9. ClinicalTrials.gov. Ciprofloxacin for Prevention of BK Infection 17. Available from: https://www.clinicaltrials.gov/show/NCT01789203. [Last accessed on 27 Feb 20]. Hardinger KL, Koch MJ, Bohl DJ, Storch GA, Brennan DC. 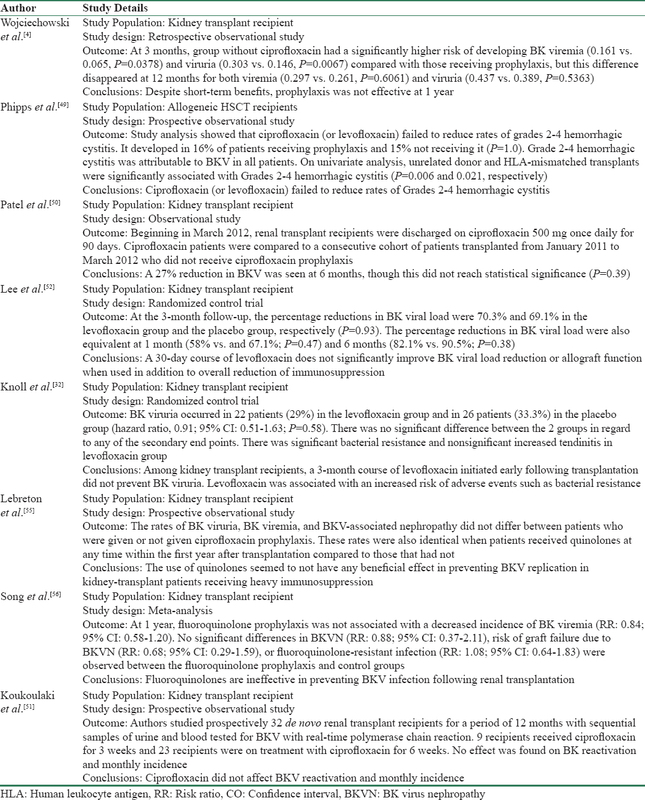 BK-virus and the impact of pre-emptive immunosuppression reduction: 5-year results. Am J Transplant 2010;10:407-15.